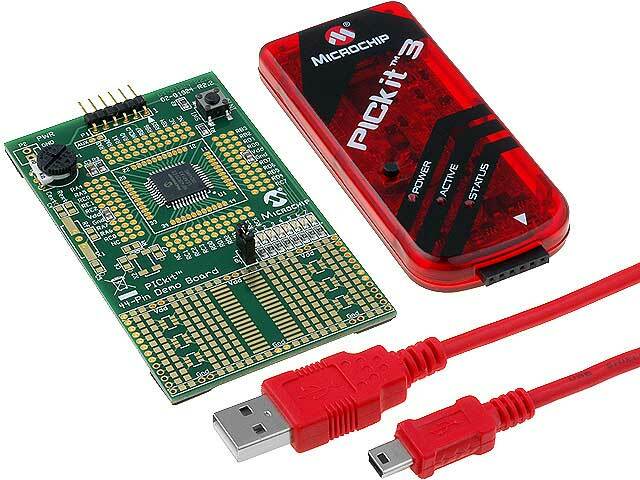 PICkit 3 allows debugging and programming of the whole family of PIC microcontrollers and dsPIC signal microcontrollers. It cooperates with an integrated, graphic MPLAB IDE environment. Apart from the programmer, the kit includes: user’s manual, prototype board with PIC18F45K20 microcontroller, USB cable and a CD with MPLAB IDE environment, free C language compiling program and a series of 12 lessons concerning PIC microcontrollers programming in Assembler (among others the use of I/O ports, embedded A/C converter, timers, interrupt traps and data tables). Lessons contain source codes for individual examples.